The first Hasselblad camera ever to be used in space almost went back into orbit at a special auction in Boston, USA this week – when the auction price rocketed to $281,250. A UK-based internet bidder beat off all comers to the legendary 500c first used by astronaut Wally Schirra on a Mercury Atlas mission back in 1962. RR Auction vice-president Bobby Livingston said: “This really is an important piece of space history. This is the camera that changed the way the Earth was viewed. He added: “It went for so much money because it comes with letters from astronaut Gordon Cooper which gives clear title to the owner…after the USA passed a law in 2012 giving ownership of these types of items to the astronauts. Until the Mercury Atlas mission in October 1962, cameras had only been used to record flight data on-board as space programme bosses were more interested in getting the astronauts home than pictures of Planet Earth. But Schirra successfully modified a standard model of the Swedish-made camera so it could be used to take photographs of the world outside the capsule. The astronaut, who died in 2007, was the fifth man to reach space and made six orbits of the earth before splashing down in the Pacific Ocean. A keen amateur photographer, Schirra bought the 500C model camera for around £300 and immediately set about modifying the viewfinder so it would be used to take images through the spaceship's portholes. Added Livingston: "Wally Schirra was a great camera enthusiast - but it was only after he took the Hasselblad with him that NASA's whole photographic identity began to take shape. Jennifer Levasseur, a curator of photography at the Smithsonian National Air and Space Museum said: "The public was fascinated by pictures of humans in space. NASA realised that it was not only important to take pictures of earth but of the astronauts too because that is what people relate to." Robert Pearlman, an expert of space programme souvenirs said: "This camera was bought with the specific purpose of capturing images of the earth and for Schirra to share with the world. Articles that flew on mercury that are in private hands are very rare and actual equipment flown aboard the vehicles is incredibly rare - for space artefact collectors this represents a very early example of space equipment." 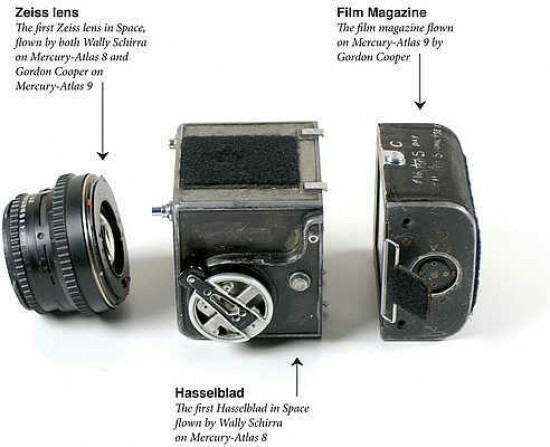 After its initial trip into space the Hasselblad was also on board with fellow astronaut Gordon Cooper for the next successful flight by Mercury Atlas 9.